great service for small properties. We offer professional property management services for properties up to 20 units. We will get to know you and your expectations of the property management you are looking for. We advise you on the right services and create an individual offer. You meet your property management on site. We answer your questions, record the details of the property and make recommendations. We take over the property management of your property and ensure a predictable rental yield. About your owner portal, you are always informed and up to date. For each property, we include all information about the property, the service contracts and the tenancy. We present ourselves personally to the tenants. 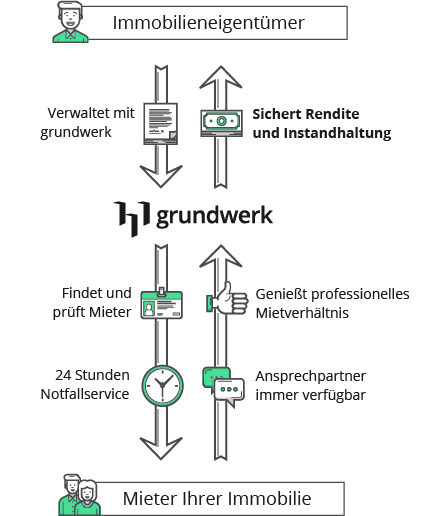 With grundwerk, the tenant benefits from a professional contact person regarding the tenancy. In case of emergency, a 24-hour repair service is available. Owners benefit from a professional tenant support, decreasing operating costs and a predictable rental yield. Only when the owner and the tenant are satisfied, we are too. and let our experts advise you.